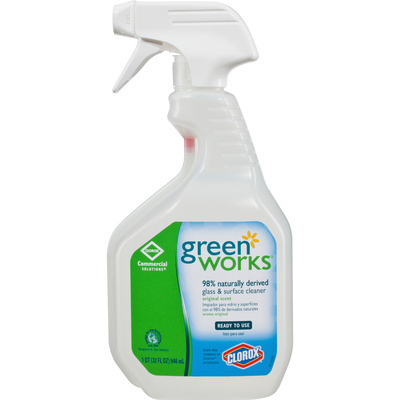 Green Works Glass And Surface Cleaner Is Made From 98 Percent Naturally Derived Ingredients That Cut Through Tough Dirt And Filmy Residue Without Any Harsh Chemical Fumes. This Powerful Cleaner Is Ammonia-Free And Safe To Use On A Wide Variety Of Surfaces Throughout The Workplace, Including Glass, Mirrors, Appliances And Stainless Steel And Sealed Granite. From Clorox Commercial Solutions, This Easy-To-Use Cleaner Quickly Removes Dirty Messes And Leaves Surfaces With A Sparkling Clean, Streak-Free Shine. The Smart Tube Technology Bottle Lets You Spray This Cleaner Down To The Last Drop. It'S Ideal For Use In Schools, Offices, Daycare Centers, Restaurants And Commercial Kitchens. With Green Works Naturally Derived Cleaning Products, You Get Powerful Cleaning Done Naturally..
Green Works Glass And Surface Cleaner Is Made From 98 Percent Naturally Derived Ingredients That Cut Through Tough Dirt And Filmy Residue Without Any Harsh Chemical Fumes. This Powerful Cleaner Is Ammonia-Free And Safe To Use On A Wide Variety Of Surfaces Throughout The Workplace, Including Glass, Mirrors, Appliances And Stainless Steel And Sealed Granite. From Clorox Commercial Solutions, This Easy-To-Use Cleaner Quickly Removes Dirty Messes And Leaves Surfaces With A Sparkling Clean, Streak-Free Shine. The Smart Tube Technology Bottle Lets You Spray This Cleaner Down To The Last Drop. It'S Ideal For Use In Schools, Offices, Daycare Centers, Restaurants And Commercial Kitchens. With Green Works Naturally Derived Cleaning Products, You Get Powerful Cleaning Done Naturally.